Title and theme: We are part of the Circle of Life. 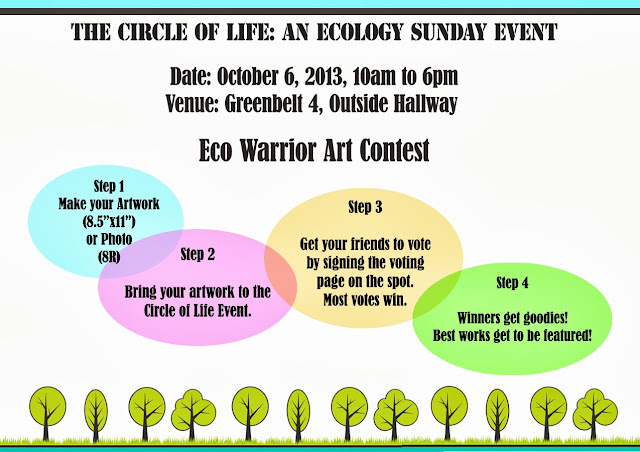 Are you an Eco-Warrior? Open to amateur photographer or artist. Take a photo or create a painting about your pets as part of the great circle of life. The art work or photo must be 8.5 by 11 inches. For Photography, 8R will be accepted. Photos are allowed to be edited as long as they convey the relevant theme. Artworks can be in any flat medium (ex: watercolor, acrylic, gouche, color pencils, etc). Mixed media is also accepted. Contestants must bring their artwork on Oct. 6, 2013, 10am. Together with a short 3-10 sentence description printed on ½ bond paper. Winners will be announced at the end of the day through an on-the-spot voting process.